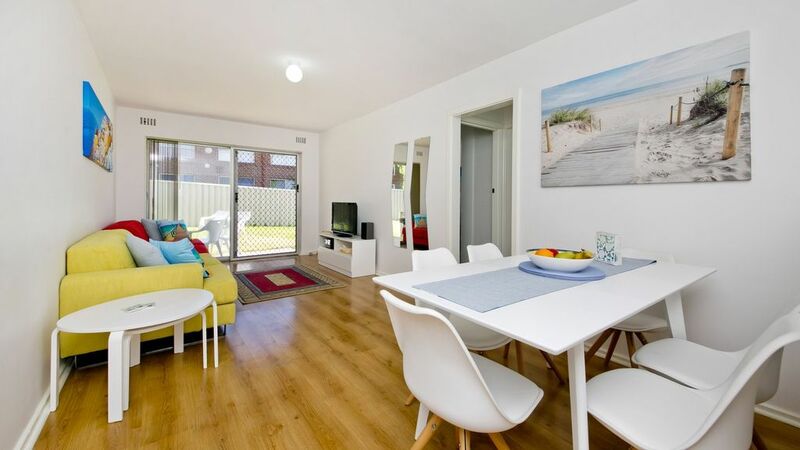 This light, bright "happy" renovated ground floor unit with new furniture is just a short 300 metre stroll to the beach. It is located in a small complex and has it's own laundry on the premises There is also plenty of parking available. It offers spectacular views of the sunset over the ocean from the lawn area right outside your back door. This is the perfect place to sit while cooking on the bbq and enjoying a drink after a long day. The unit has two bedrooms with a queen bed in one and a bunk bed in the other comprising of a double mattress on the lower bunk and a single on the upper. The unit is fully self contained. Tea, coffee milk and sugar is also provided along with basic pantry items. Outside the complex is a bus stop which takes you directly to the Stirling Train station for those who may wish to visit the city attractions. Very clean and extremely well presented, comfortable and homely property. We had a two night weekend stay to be close to a function we were attending in the area. Peter and Dianne gave us a very friendly greeting on arrival, explained where everything was and how it worked. The unit had everything we needed for our stay. It's on a quiet street with a park across the road and near the beach. Modern furniture is comfortable in this beautifully decorated unit. Scarbough Beach entertainment area and restaurants are a short drive away with the choice of three good sized supermarkets close by. We thoroughly enjoyed our stay and would have no hesitation staying again or recommending to others. Our guests were lovely people with great communication. They were very tidy, easy to get on with and were a pleasure to have stay at our unit. It was nice meeting them. We would highly recommend them to any host. Totally enjoyed our stay and would come back again. The fruit plate on arrival was a lovely touch. Friendly and helpful hosts. Highly recommend.